Gold Vermeil and Onyx Dangle Earrings, "Love of Life"
Bathed in 22k gold, hoops of hammered silver host verdant stones. 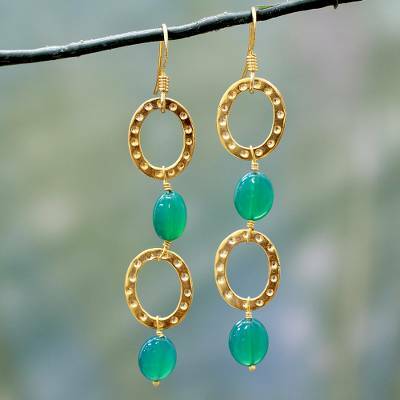 This design from Bhavesh showcases onyx in beautiful drop earrings. You can find gold vermeil dangle earrings 'Love of Life' by Bhavesh in jewelry categories such as Bollywood Earrings, Birthstone Earrings, Onyx Earrings, Gold Earrings, Vermeil Earrings, Silver Earrings, Sterling Silver Earrings, Gold Earrings, Gold Plated Earrings and Dangle Earrings. Enjoy exploring these sections for other Novica treasures.